This makes a sauce that is 95% of her Mole, but I prefer to make a very large batch as it is a project to do and doubling of the recipe doesn’t take much more time to make. Then you have this cache of amazing flavor that spices up any dish with no extra time but lets all of the flavor and work shine through. 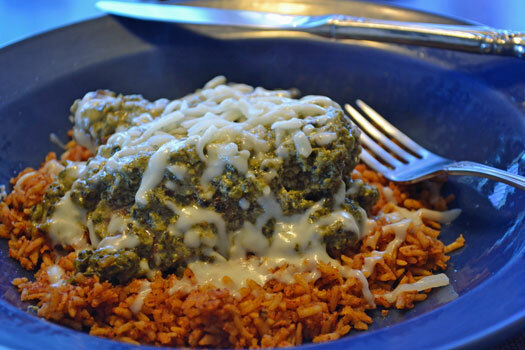 It is a wonderful basis for enchiladas, nachos, stews, soups, sloppy Joe’s, burritos or even spooned over eggs in the morning. I like to add about half tomato sauce by volume to make a great sauce that is smooth and mellow with the taste of the chiles but none of the bite. Colorado means “red” in Spanish, usually referring to a deep brick type of red, so coloradito is “little red”. We’ll give you the recipe first, then walk you though the preparation in photos so you can see the stages and progression. These chiles can easily be grown in your garden for most of North America, or at a well-stocked Mexican grocer. For the Mexican chocolate, Ibarra is a well-known brand that is available almost everywhere. If you really want to take the flavor to the next level, look at Taza Chocolate. It is stone ground in the traditional Mexican village tradition and has a flavor that is absolutely to die for, not to mention being fair trade and traceable to the source. You can see all about how your batch was made by entering the batch number into their website! There are 3 steps to this recipe: processing the chiles, processing the spices and processing the tomatoes, onions, plantains and seasonings. 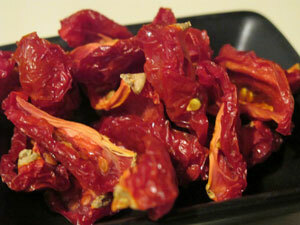 Some cooks will stem and seed the chiles while still dry, toasting the pieces. Others will toast the chiles whole, then soak them to soften the skins and remove the stems and seeds. Bring 2 quarts of water to a boil. Meanwhile, heat a dry comal, griddle or a cast-iron frying pan over low heat and toast the chiles on both sides for about 5 minutes. Toast the Anchos a bit slower and on a lower heat because of their thicker skins. Toasting them blisters and loosens the skins and gives off a rich chile aroma. It may be best to toast them in smaller batches so the pan or comal is not crowded. You need room to move and turn the chiles in the pan. Remove the chiles, place them in a large bowl with the hot water. Cover or weight the bowl with a plate to keep the chiles submerged. Soak for about 20 minutes to fully soften the dried skins. 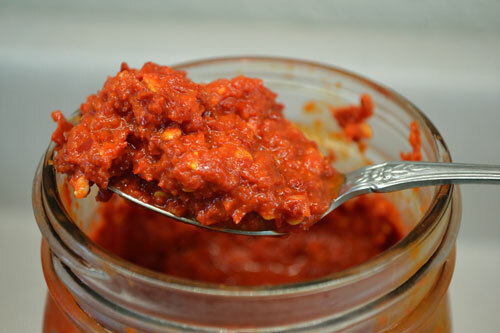 If chiles have been stemmed and seeded, puree in a blender using as little of the chile water as possible to make a thick paste, usually about a cup. 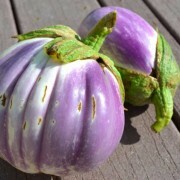 If chiles have not been stemmed and seeded, do this first, then puree in blender. 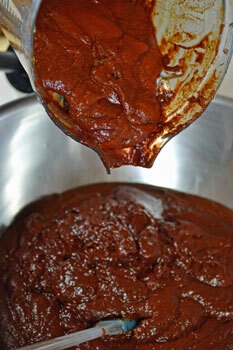 It is best to do this in small batches to not overload and overheat the blender, as the chile puree is quite thick. Depending on your blender, you may have a smooth paste at this point, or you may have some small pieces of skin. If skin pieces are present, pass the puree through a food mill or sieve to remove the skin pieces. Set aside. After processing the chiles, heat the dry comal, griddle or cast-iron frying pan over medium heat and toast the peppercorns, cloves, allspice, cinnamon stick, cumin and coriander until they release their aroma. 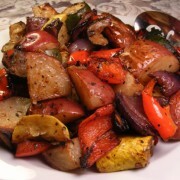 Stir the spices constantly to prevent burning and to monitor the toasting process. Set the spices aside. Grill the garlic and onion on the dry frying pan, turning often until they become translucent. They may stick a bit, but keep turning. Puree the spices, onion and garlic with 1/2 cup of the chicken stock. Set aside. Heat the cast-iron frying pan to medium and cook the tomatoes and oregano with no oil until the condense, usually about 10 – 15 minutes. 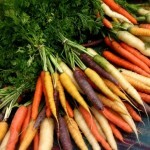 They will give off their juices, then start to condense as the juices evaporate. Once condensed, set aside. Heat 2 Tbs of the oil over a medium heat in a cast-iron frypan and fry the plantain until brown, about 10 – 12 minutes. Remove from the pan, add raisins and fry until plump, about 3 minutes. Remove and set aside with plantain. Fry the almonds until light brown, about 4 minutes. If needed add a little additional oil, but the amount should decrease with each ingredient until the almonds are almost being dry-fried. Puree the plantain, raisins and almonds in a blender with 1 1/2 cups chicken stock until smooth. 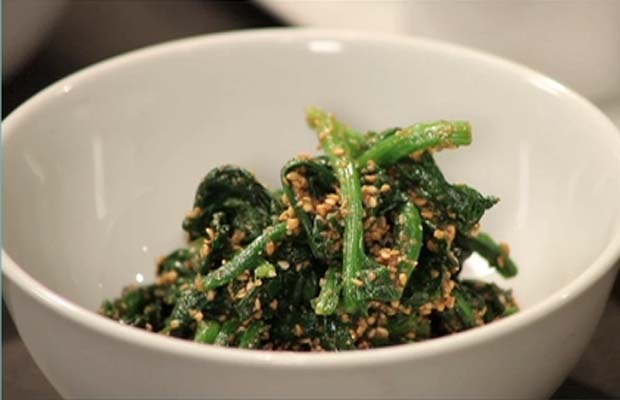 Heat frying pan over low heat, add 1 Tsp of oil and gently fry the sesame seeds until just turning brown, about 6 – 8 minutes, stirring constantly. 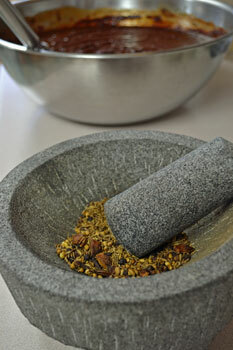 Remove, cool and grind in a spice grinder or food processor. In a heavy stockpot, at least 6 quart capacity, heat 1 Tsp of oil until almost smoking on medium-high heat. Add chile puree and cook, stirring constantly. It will splatter, but keep stirring until heated through. Once heated, lower heat to medium-low and cook for about 20 minutes, stirring frequently. When chile puree starts to thicken add tomato mixture, lower heat to low and cook another 15 minutes, stirring to keep from sticking or burning. Then add onion and spice mixture and stir well. Add pureed plantain and sesame mixture and stir well. Cook a further 10 minutes, stirring constantly to keep from sticking. If you are making a larger batch and freezing some, add 2 cups of chicken stock, stir in well then add the chocolate and stir constantly. Once the chocolate has dissolved, add the salt, stir in well. Reduce heat to a slow simmer and let cook for 10 – 15 minutes, stirring frequently to avoid sticking. It will be a thick sauce, ready for freezing in jars. Let cool, then ladle into mason jars leaving an inch gap at the top. Will keep in the freezer for up to a year. If you are making the batch to use fresh, add 5 cups of chicken stock to thin the sauce, then add the chocolate, stirring constantly. Once the chocolate has dissolved, add the salt. Lower the heat to a slow simmer and let it cook down for at least 30 minutes, stirring occasionally. It should coat the back of a spoon, but not be much thicker when done. Recipe Tip! It doesn’t take much longer to make double the recipe and freeze for an easy, delicious dish later! This may sound complicated or a lot of work, so we will walk you through the process and show you what each step looks like. It is a good day’s worth of work, but it can be broken up into a couple of days if you don’t have the time to make it all in one day. Once you taste the results, you will immediately see why it is worth the effort to make a large batch! 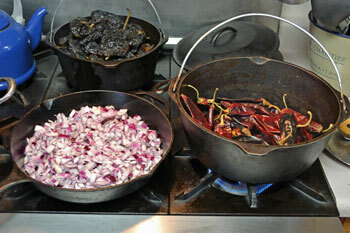 In the first photo, we are toasting two of the different chiles and dry frying the onion and garlic in another pan. We have learned to save a lot of time by combining a couple of steps at once. The Ancho chiles are in the back with the Pasilla Bajio or Chilacas in front. 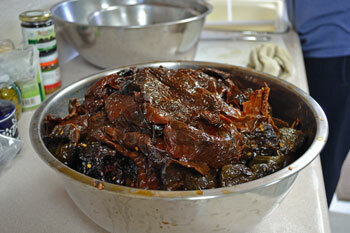 These are the chiles after toasting, soaking and being stemmed and seeded. Most of the work happens right here, to get to this stage. After this everything is roasting and toasting, then using a blender to puree everything into a sauce. To give a sense of scale, this bowl is over 18 inches across! Into the blender with the chiles! We have a Vita-Mix blender that is a real blessing with big projects like this. 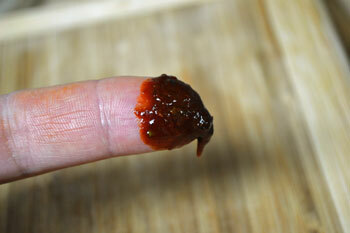 It stands up to the thick sauce without overheating, but we still need to process all of the chiles in batches. 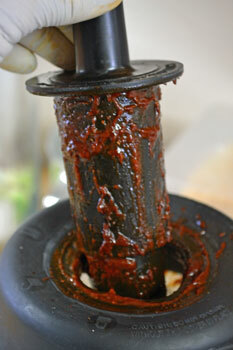 We usually fill the blender about 1/3 full with chiles and add just enough soaking water to make a thick paste. Please notice the gloves, I use them when working with chiles for extended periods of time to keep me from itching my eyes with a chile-infused finger! It is easy to see why the name of “colorado” is applied to this sauce – look at that beautiful rich brick red color! My mouth was watering for most of the time after we pureed the chiles as the kitchen was filled with their aroma. 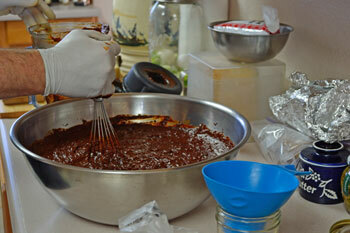 There is not too much volume lost from the soaking stage to the pureed stage. This is the same bowl after we’ve finished pureeing all of the chiles. Next up is toasting and grinding the spices and seasonings. 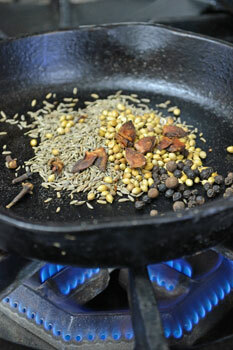 We used a smaller cast-iron pan to toast the spices and release their aromas. A molcajete is what we use simply because we have one. 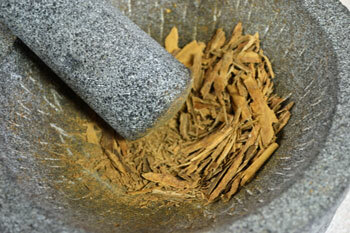 It is great for grinding spices and really working them to release their flavors and aromas. A food processor or blender can do much the same with less effort. 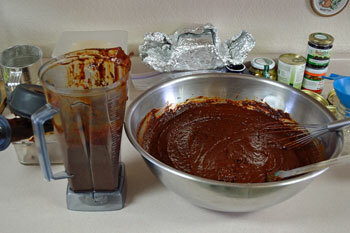 A few minutes later, here is what the ground spices look like, ready to be mixed into the chile mixture. At this point we’ve also pureed the onion and garlic and mixed it into the chile sauce. Now it’s time to mix it all together! This photo helps to show the scale of everything, as the whisk is almost a foot long and I’ve got my hand completely wrapped around it to work all of the purees and spices together. After everything is mixed together and cooked at a slow simmer, we put it up in jars to freeze for later. 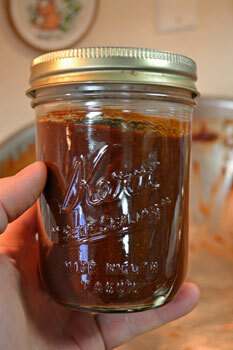 We use pints, as this gives a generous amount of sauce without being too much after a couple of days. We leave about an inch or little more of space at the top to allow for expansion in the freezer. All done except the clean-up! 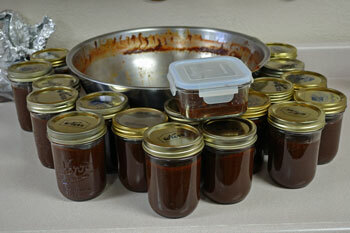 This particular batch made 17 pints of scrumptious chile sauce, with just a bit left over for the next morning’s eggs. This will give us almost a year’s worth of chile sauce. A close-up of the color and texture of the finished product. Well worth the work!